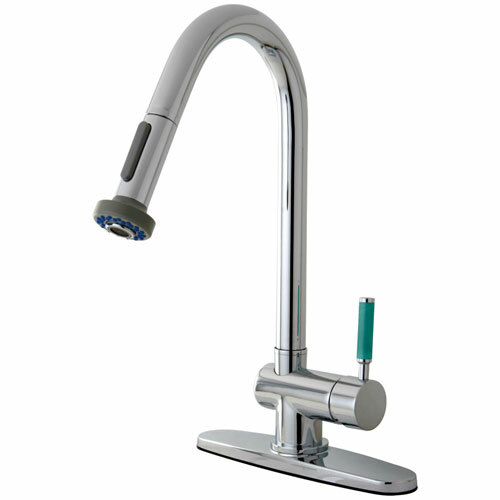 Kingston Green Eden Chrome Pull Down Single Handle Kitchen Faucet GS8881DGL: This Pull Down Spray Kitchen Faucet is built to last. The highest quality standards are used to precision manufacturer a top of the line product. Important features of this BRAND NEW Fixture: Complete Item! Everything necessary for installation is included. - Solid Metal Lever Handle - Matching Accessories Available - Easy to Install - Installation instructions included - Pull Down Spray Kitchen Faucet - High Quality Brass Construction - Green Neoprene handle for a great grip and easy clean-up - Drip-free Ceramic Cartridge System - Ten-Year Limited Warranty - Flow Rate: 2.2 GPM - Spout Height: 17-inch, Spout Reach: 8-1/4 inch - Characteristic of the Green Eden series with its Neoprene accents and sleek contemporary lines, this Spring spout kitchen faucet will be a welcome addition to any kitchen where adding color and a youthful flair are essential to create the specific decor style you desire, its spring spout gives you plenty of clearance and versatility and its single handle operation makes it easy to operate at any age, This faucet is also available in Satin Nickel. Can be installed in a 1 or 3 hole application. - Chrome premier finish designed to resist fading and tarnishing. This fixture is manufactured by Kingston Brass and is part of their Green Eden collection. Characteristic of the Green Eden series with its Neoprene accents and sleek contemporary lines, this Spring spout kitchen faucet will be a welcome addition to any kitchen where adding color and a youthful flair are essential to create the specific decor style you desire, its spring spout gives you plenty of clearance and versatility and its single handle operation makes it easy to operate at any age, This faucet is also available in Satin Nickel. Can be installed in a 1 or 3 hole application.